We arranged to meet for the first time at a park, and when I got there, he was even cuter than in his pictures. Then he went running after a ball. It was my first online date with a dog. Atlas, a sweet, cheerful two-year-old black Lab with his own Instagram, is a member of a new dog-sharing app called Bark'n'Borrow, which matches dog owners up with people like me, who wish they could own a dog but can't. (In my case, my lease doesn't allow pets.) Dogs get some extra attention, dog owners can get a free dogwalker or sitter, and dog lovers can play or cuddle with a charming new friend. It might be a natural step in the sharing economy: If we share our apartments and cars and power tools, does it also make sense to share our pets? Liam Berkeley, the founder of Bark'n'Borrow says. "I was contemplating rescuing a dog—I grew up with dogs—but I was working 12 or 13 hour days. My girlfriend at the time was still in school and had a job on the side. So as much as we were thinking of getting one, we knew it wasn't the best idea." But Berkeley started to meet neighbors with dogs. He says. "I started talking with them, and I'd play with their dogs. I ended up saying, 'Hey, I go running a couple afternoons a week, and I'd love to take your dog for a run if possible.' They said yes, after getting to know me a little bit." As he took the borrowed dogs out for hikes, he kept meeting other people who, like him, missed owning a dog of their own. And so Berkeley decided to put together a simple dog-matching service. "I thought, this is unfair that there's no medium between not owning a dog and committing to one for the next 16 years of your life. And why do dog owners pay someone to look after their dog when there are people like myself who would love to do it and not expect to get paid?" He made up a few flyers, started talking to people on hikes, and realized that there was enough interest to build a website, and later an app. A year later, he's working full-time on the startup, with seven employees and a round of funding. The app is simple: Each dog has a photo, some basic data like age, breed, how well trained it is, and how well it gets along with other dogs and children. The profiles also include keywords (Atlas is "curious," "affectionate," and "loyal," among other expected qualities for a dog). Dog lovers can reach out, and then go meet with an owner; if everyone gets along, they can arrange for dog walking or sitting later. Of course, it takes some trust on the part of the owner. Sam Alter, Atlas's owner says. "The big hurdle for me is, how do I know you're not going to steal the dog or hurt the dog? Or what happens if the dog gets hurt while it's in your care?" Bark'n'Borrow says it vets each potential borrower, and Berkeley thinks it can work as long as everyone takes the time to get to know each other. He says. "When I reached out to owners at first, they weren't hesitant at all. Maybe because I showed my passion and interest in their dog, got to know them. I wanted to build a platform that allowed people to do the same thing." For now, dog owners and borrowers pay nothing (the app also connects professional dog walkers who do charge a fee, but the main service is free, at least for now). Alter says. "I can pay $20 for a half hour with a dog walker, or I can find someone who just wants to do this because they love dogs." Eventually, Berkeley plans to charge a small fee for borrowers as well. He says. "I would have paid for this." The fee will help cover insurance and customer support, and a portion of the profits will go to animal rescue. The service also plans to eventually partner with shelters to connect people with foster dogs. It's a popular service so far. Alter says. "I signed up two days ago, and I've already had 10 or 15 people reach out." I'm hoping to borrow Atlas when Alter is out of town for a weekend, and experience a little temporary dog ownership. Berkeley says. "Not being able to own a dog, after growing up with one, you miss something in life. There's just something about it." COMMENTARY: According to Statista, in 2000 there were an estimated 68 million dogs were owned in the United States. By the end of 2012, the number of dogs living in U.S. households increased to 78.2 million. It is now estimated that there will be 77.8 million dogs in U.S. households by end of 2015. According to the American Pet Products Association, pet owners will spend an estimated $60.59 billion on their pets. The creators of Bark'N'Borrow obviously picked a huge industry for their app. Technology is impacting every industry and this app obviously fills a real need in the marketplace. Choosing the right pet, especially if you are not sure of the breed, or unfamiliar with the personality of that breed, is vitally important in making the right decision. Bark'N'Borrow provides the perfect solution to the product, allowing new pet owners an opportunity to 'try-out' the dog before they make a serious committment to buying that dog. I love this app and what it can do for existing and new pet owners. While some Houzzers have outfitted entire homes and yards to accommodate their beloved cats, such measures may not be realistic for all. The good news: There are plenty of ways to make your home more comfortable and fun for your favorite feline without sacrificing style. 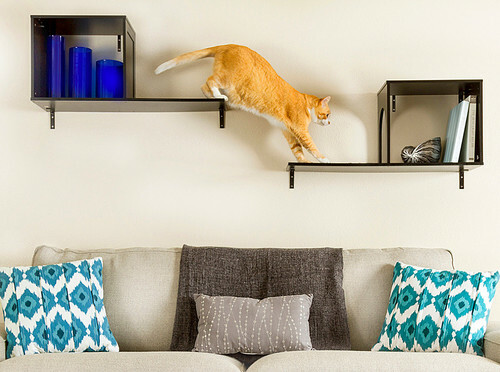 Contemporary cat condos, wall-mounted trees, beds and even stylish litter box enclosures are available in the Houzz Products section. The set of shelves of the Sophia Wall-Mounted Cat Tree not only acts as a cat tree, but one of the pieces also has room to keep books and kittyproof knickknacks, which helps the shelves blend in with the rest of the room. (If you’ll be displaying a plant, be sure to select one that’s safe for cats.) The other piece has an opening for your cat to climb through. 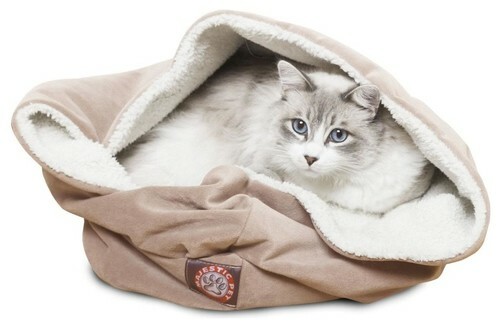 If your cat is the type who jumps onto the bed while you’re trying to change the sheets to get made up right in it, then he or she will love to snuggle up in the Microvelvet 17-inch Burrow Bed. It’s made for comfort with a waterproof base, supersoft microvelvet and stuffing. The Microvelvet 18-inch Canopy Bed is filled with stuffing too and covered in a mix of microvelvet and cotton Sherpa. “Stylish cat condo” is no longer an oxymoron. The Acacia Cat Tree is a kitty tree that will fit in with your decor and give your pets lots of climbing fun. It’s 3 feet high, giving your cats a perch for watching out the windows, and as an extra draw, it has removable Velcro scratching pads. 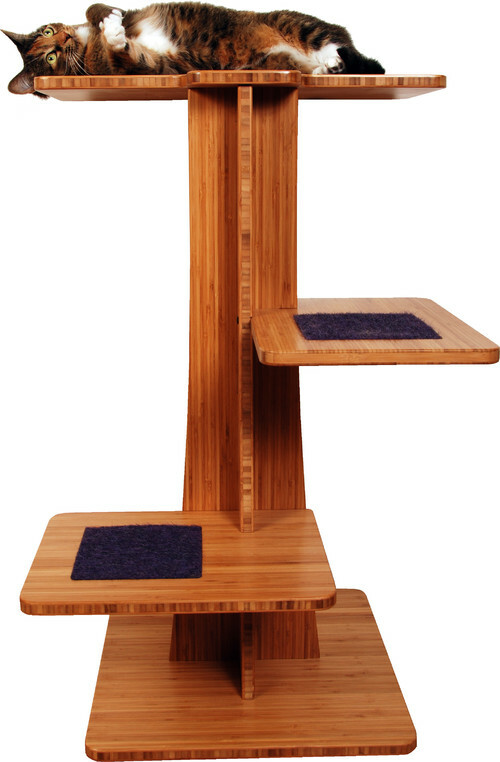 For those who prefer a wood finish to white, the Acacia Cat Tree also comes in rich bamboo. 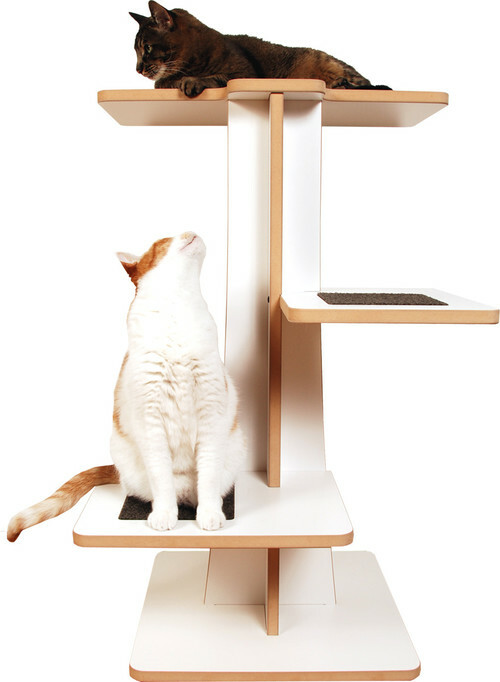 If your tastes lean more toward Philip Johnson’s Glass House, this boxy, Jenga-like Sebastian Modern Cat Tree climbing tree is for you and your Mr. Whiskers. Made of engineered wood, it comes in black or white. 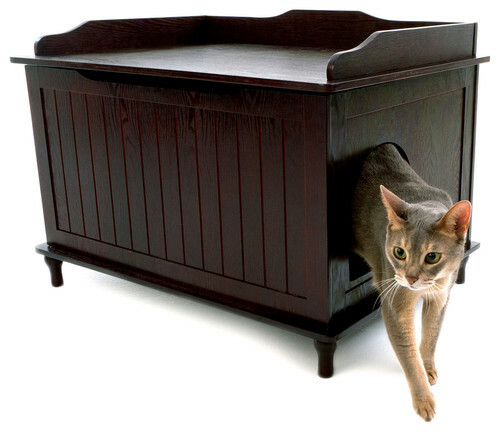 Ugh, the dreaded litter box can ruin an entire room’s style, but not with this smart Designer Catbox Litter Box Enclosure camouflaged as a piece of furniture. The litter pan, litter scoop and other accessories are completely hidden inside, and the lid lifts up for easy cleaning. The espresso-colored engineered wood piece is sturdy enough to serve as a bench. 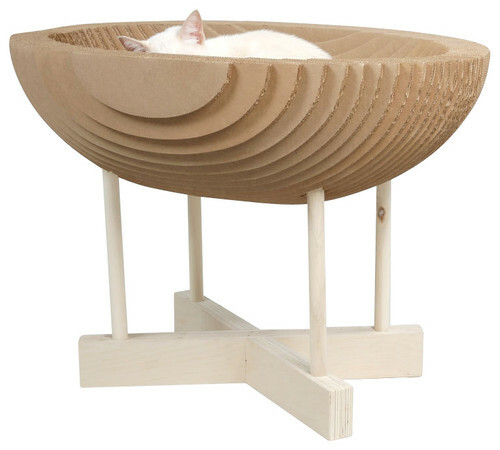 Whether Snowy wants to sink her paws into a little climb or nestle in for a nap, this Kittypod Purrounge Chaise Lounge will suit her just fine. The strong corrugated cardboard adds hip texture. If your baby prefers a crib-like place to sleep in, this raised Kittypod bed could be worth the splurge. Remember how much they like the feel of cardboard under body and paw. For extra comfort atop the industrial-strength corrugated cardboard, consider adding a Kittypod Shred (next). 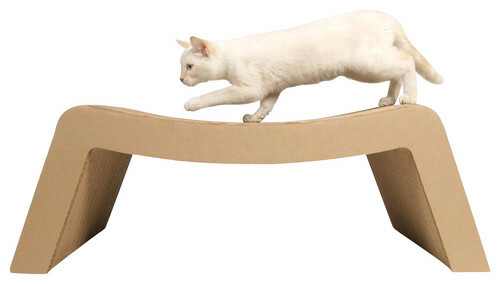 You know the deal: Your cat has a favorite napping spot, perhaps on a chair with a light-colored seat cushion. 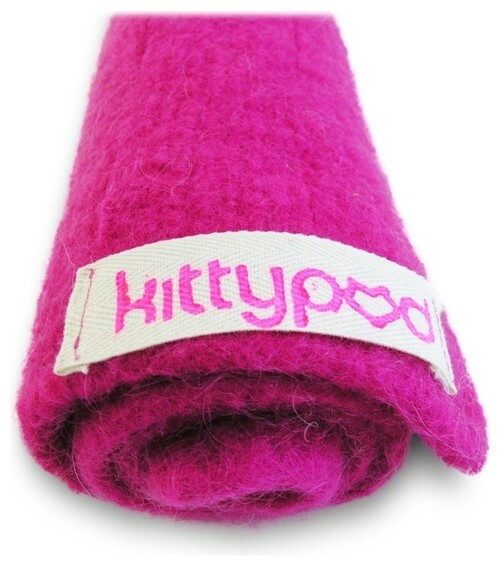 Make your cat’s naps even better while saving your upholstery with this wool cat-size Kittypod Shred in Pink throw blanket. It also fits as a soft layer atop any of the Kittypod stands. 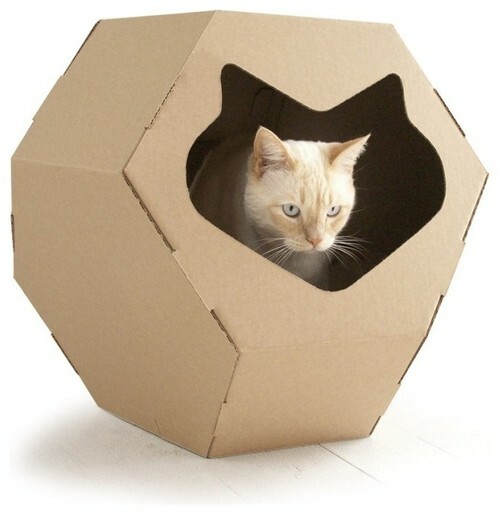 This Kittypod Geodome cat hideout combines geometry with a cat’s-head silhouette. 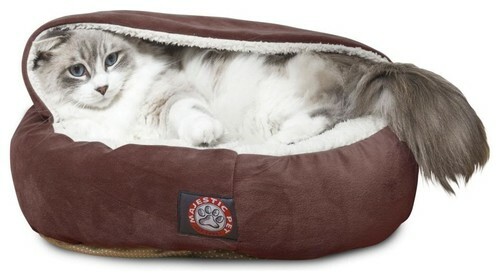 It’s made of superior-grade durable recycled cardboard and outfitted with two doors and an interior scratch pad. 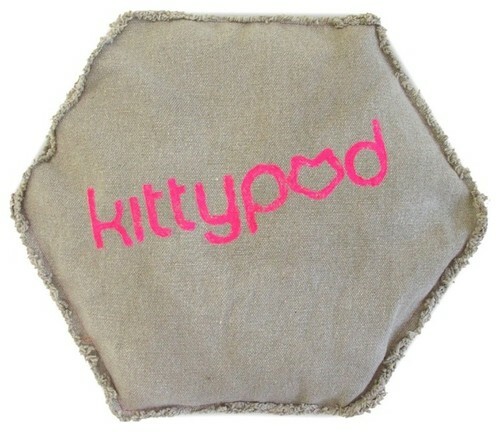 This Kittypod Geodome Sac will add softness to the bottom of your cat’s favorite lair, like the Kittypod Geodome above. COMMENTARY: Now that's what I call loving your cat. You know those people whom stray animals just seem to find? When it comes to cats, Tom and Liz are those people. At present 16 cats have found their way into their hearts and home. Some are shelter cats once deemed unadoptable, others have wandered onto their property, and a few came from various relatives who could no longer care for them. For this reason we’re withholding their last names and exact location, lest anyone get any ideas about leaving more cats with them. Tom and Liz love to save cats, but they are at their limit. When the couple moved to this home in Paradise Valley, Arizona, cat safety and quality of life were priorities. Their property is about an acre, surrounded by desert wilderness. Predators like coyotes, great horned owls and foxes prowl nearby, and even some of the plant life around can injure cats. A secure enclosure was a must. Here’s how they created cat heaven. The enclosure is about 600 square feet total. Tom began by sketching out his ideas and rendering his plans using 3-D software. While he had a good understanding of construction and framing, he enlisted some help in setting the redwood fence posts in concrete. The rest of the work he completed by himself on nights and weekends. The project took a few months. The metal you see here is plastic-coated galvanized fencing. The vertical posts are 4- by 4-inch redwood fence posts; the horizontal ones are 2-by-4s. The entire redwood structure has a waterproof stain. Bird netting overhead protects the cats from winged predators. Shade sails provide relief from the sun. Liz says. Tom installed a system of catwalks, ramps and steps to connect the “catio” to the main house and the guesthouse. Here is Tom working on the steps from the guesthouse to the top of the kitty enclosure. The guesthouse is now a full-time cat residence, complete with linoleum floor and fiber-reinforced plastic on the walls, which can be easily wiped down. Along the catwalk system is “the celestial viewing platform,” as the couple calls it. The cats enjoy sitting and taking in some of the best views on the property here. A ramp leads from a platform along a catwalk to another ramp that goes to the ground level. The experts at The Pond Gnome installed a pond inside — a habitat for koi, goldfish and mosquitofish. Contrary to popular belief, the cats don’t go after the fish, but they do enjoy watching them. Liz and Tom are teaching the koi to come when they are called via treats (it’s a koi thing, they swear). Liz says. While they planned on lots of quality cat-visit time out in the enclosure, Tom and Liz were surprised to find how much they enjoy just hanging out in here, too. Liz says. I know what you want to ask but are too polite to. The answer is, they rake out the enclosure once a week, and the cats also have litter boxes indoors. In fact, the couple is even training the cats to use the toilet in the guesthouse. I forgot to ask if they got the idea from Meet the Parents. The cat enclosure is a work in progress. The to-do list includes adding rain gutters, box planters and cat grass along the perimeter. Some special cat doors that operate via magnets will control which cats can access the main house while barring those with spraying issues. COMMENTARY: Well, that's what I call a great idea if you love lots of cats. You definitely need some kind of enclosure to keep them under control. I didn't see any protection for the koi fish. It would be a huge shame if one of the cats were to catch a koi and kill it. Koi fish are very expensive--upwards of $1,500 each. What a shame that would be. I have always like Labs. This stocky puppy is going bonkers trying to figure out why the door stop spring jiggles. KENYA HARA, ART DIRECTOR FOR MUJI, WANTS TO RECONSIDER THE DOG HOUSE. THE CANINE WORLD WILL NEVER BE THE SAME. We’ve all heard of dog houses, but you’ve probably never heard the phrase "dog architecture." This divide is something that Imprint Venture Lab and Kenya Hara, art director at Muji, want to change with their latest project, the aptly named Architecture for Dogs. Projects on the site challenge traditional notions of scale, perspective, and function, ranging from a variegated rug of aluminum tubes--a dog cooler for those hot summer days--to a pair of ramps for short-legged dogs, which double as a shared recliner for human and dog alike. The projects are united with care. Each is crafted to a dog’s concerns. For instance, a hammock for Jack Russell Terriers isn’t just a hammock; it’s a hammock stretched from the owner’s clothing, meaning the dog can appreciate their smell while resting. A "mobile home" for Shibas looks like a stroller at first glance, then you realize its materials are meant to mimic the natural shade of a tree and the carriage has been designed to carry the dog as closely to the ground as possible, allowing its short legs to hop out at will. Each design is downloadable as a free blueprint, and next year, the collection will be available in flatpack kit form. Dogs are a species made for humans, forced to live in houses also made for humans. With Architecture for Dogs, Hara has assembled a team of elite designers to reconsider the dog’s experience in an otherwise human world. And reconsidering dog-level design, in turn, is a means to allow humans to be more mindful of their own environments. COMMENTARY: From the look of the smiles on these spoiled rotten pooches, I would say that Kenya Hara is on the right track with his Architecture for Dogs. As a lover of dogs, I would certainly buy some of these doggie creations. They are not only beautiful and functional, but could be considered doggie art pieces, that would embellish the home. The dogs certainly appear to love them, so I strongly recommend he begin building those kits. I have a feeling Kenya and the designers will do quite well. The worldwide pet market did over $60 billion in sales in 2011 alone. We're not just talking dog food, collars and leaches, either. Pet owners spend hundreds, and sometimes even thousands of dollars on merchandise for their dogs (and cats, too). Architecture for Dogs shows what can be done to spoil pooches even more. We love our pets to bits and share everything with them. So why, when it comes to rocking chairs, we should get all the fun? Rocking-2-getherby Paul Kweton fixes the injustice. The piece is a rocking chair and a pet bed combined. Here is how the designer describes it: ‘The “merge” & “morph” manipulation of the old school rocking chair and doghouse generates a hybrid “furniture” that combines the idea of shelter and body relaxation and pushes its functionality to a different, more personal level.’ So there you are – a dual function both you and your pet will love. COMMENTARY: That's what I call a happy pooch. Simply ingenius. Since the moment it was revealed that the "nation's most courageous dog" served alongside the 80 Navy SEALs who took out Osama bin Laden, America's fascination with war dogs has hit a fevered pitch. And while the heart-tugging photos of these four-legged heroes are worth a look, so is the high-tech gear that helps them do their job. COMMENTARY: I thought that only our combat soldiers wore kevlar protective chest and body armor and the latest electronic gadgetry. That's what I call a combat ready robo dog. Got to protect these incredibly intelligent and brave animals who put their life on the line catching bad guys. They are worth every bit of that $30,000. I love them dogs, and every terrorist and and jihadist out there, beware punks--the U.S. Navy SEAL Robo Dogs are on your trail. Go U.S. Navy SEALS, SEAL Team 6 and the Robo Dogs!! If you enjoyed this post you will definitely enjoy my post dated March 8, 2011 titled,. "The Business of Counter-Terrorism And The Elite SEAL Team Six, The Secret Fighting Group That Got Osama Bin Laden."